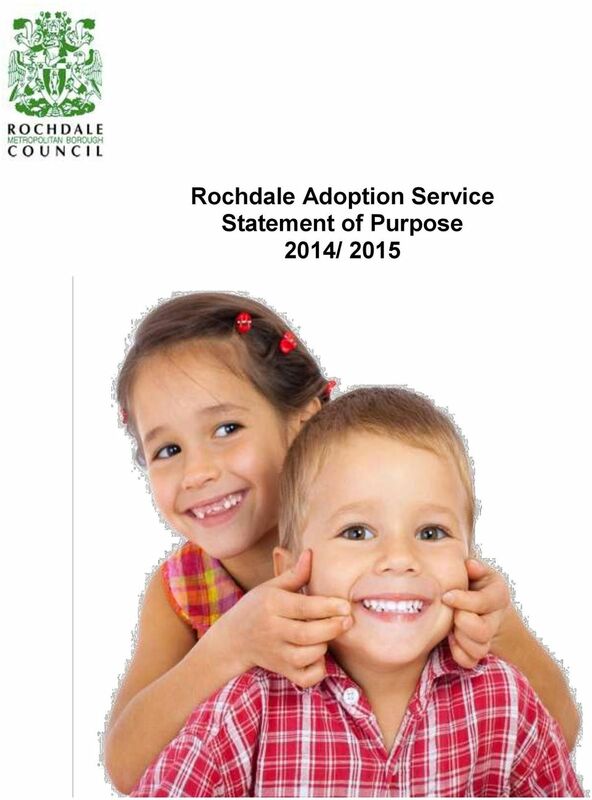 Download "Rochdale Adoption Service Statement of Purpose 2014/ 2015"
2 1. 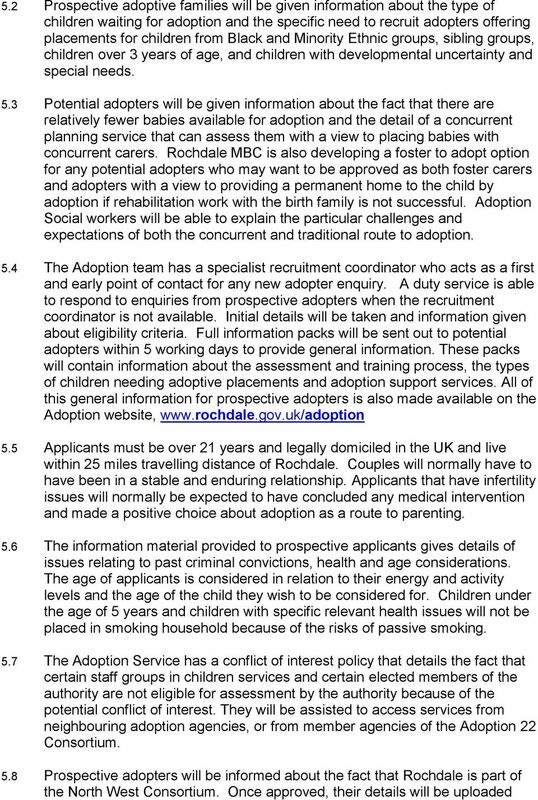 Introduction 1.1 Rochdale Metropolitan Borough Council is committed to providing a high quality adoption service. The statement of purpose will detail the aims and objectives of the service, quality assurance mechanisms, and the range of services provided to children, prospective adopters, adoptive parents, adopted adults and birth families. 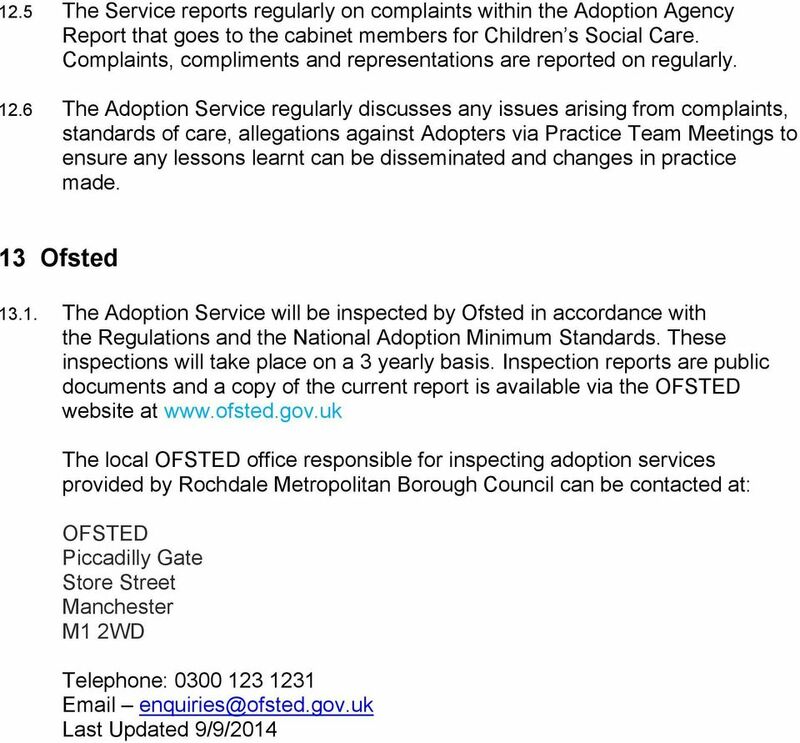 1.2 The Statement of Purpose includes details of the staffing and organisational structure of the service, management arrangements, complaint procedures and the details of the Office for Standards in Education, Children s Services and Skills (Ofsted). 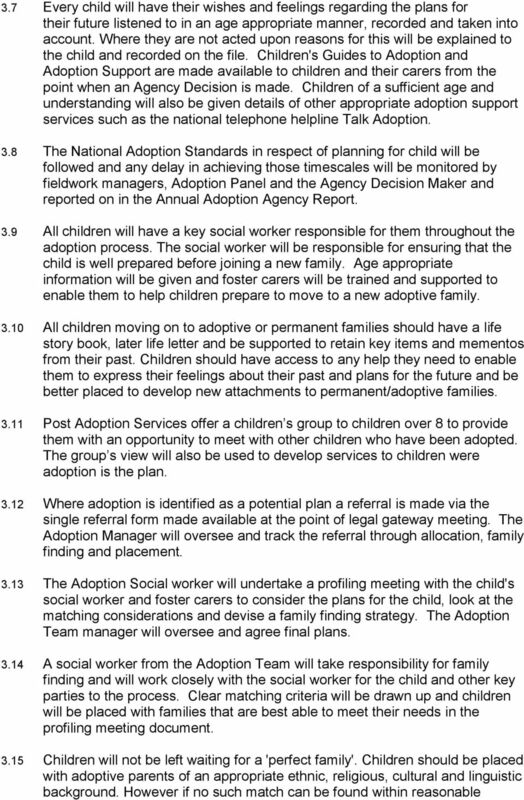 1.3 The principles within the statement of purpose apply to placements made with other adoption agencies and also non agency placements such as step parent, kinship and inter-country adoptions. These placements will receive the same high quality professional and management attention. 2. 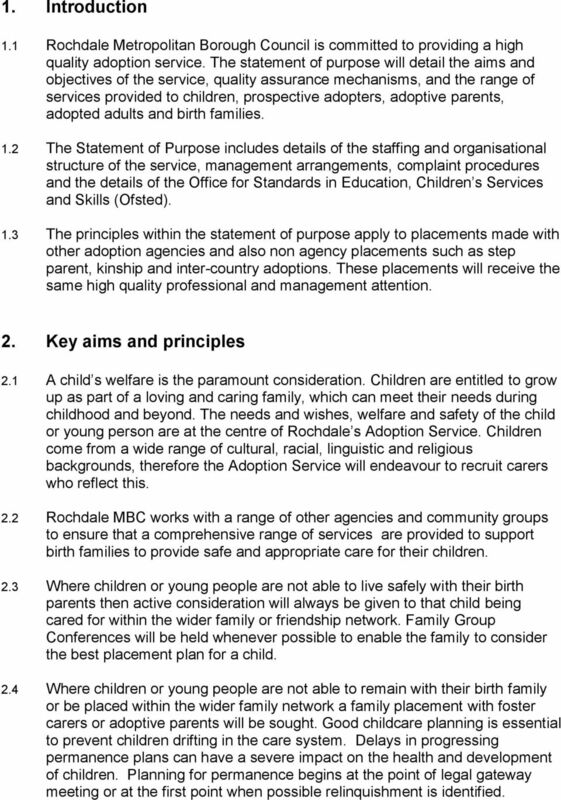 Key aims and principles 2.1 A child s welfare is the paramount consideration. Children are entitled to grow up as part of a loving and caring family, which can meet their needs during childhood and beyond. The needs and wishes, welfare and safety of the child or young person are at the centre of Rochdale s Adoption Service. Children come from a wide range of cultural, racial, linguistic and religious backgrounds, therefore the Adoption Service will endeavour to recruit carers who reflect this. 2.2 Rochdale MBC works with a range of other agencies and community groups to ensure that a comprehensive range of services are provided to support birth families to provide safe and appropriate care for their children. 2.3 Where children or young people are not able to live safely with their birth parents then active consideration will always be given to that child being cared for within the wider family or friendship network. Family Group Conferences will be held whenever possible to enable the family to consider the best placement plan for a child. 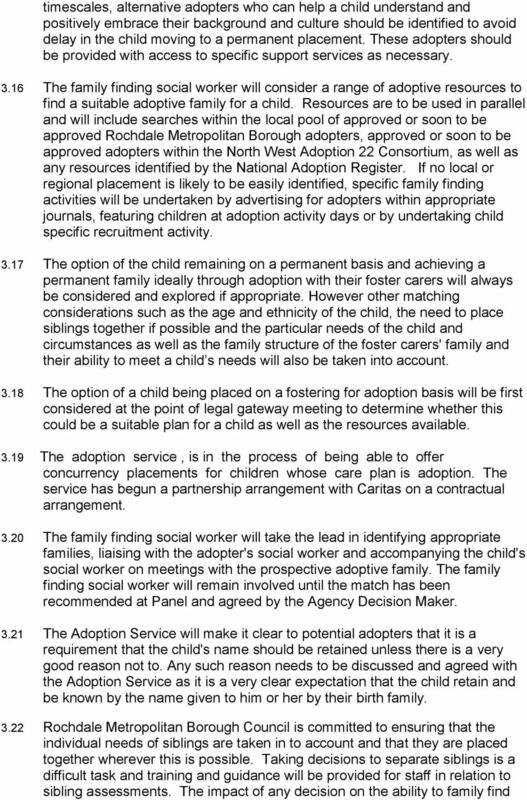 2.4 Where children or young people are not able to remain with their birth family or be placed within the wider family network a family placement with foster carers or adoptive parents will be sought. Good childcare planning is essential to prevent children drifting in the care system. Delays in progressing permanence plans can have a severe impact on the health and development of children. Planning for permanence begins at the point of legal gateway meeting or at the first point when possible relinquishment is identified. 3 2.5 Birth parents and birth families will be provided with a service that recognises the lifelong implications of adoption. They will be treated in an open, fair and respectful manner throughout the adoption process 2.6 The views and wishes of the child should be sought by a range of age appropriate means. The Children s Rights Service plays a key role in promoting the wishes and views of children in care and enabling their voice to be heard. The Independent Reviewing Officers will also ensure that a child s wishes have been sought and are included in the care planning process as appropriate. If adoption is agreed as the plan children will have his or her wishes and feelings recorded and taken into account. Age appropriate children's guides to adoption are available to all children where adoption is the plan. 2.7 The Adoption Service will aim to provide a diverse and wide range of adoptive placements to meet the needs of children who are being placed for adoption. The service will maintain a clear, inclusive and pro-active recruitment strategy to encourage prospective adopters from all backgrounds and walks of life. 2.8 Prospective adoptive parents will be treated fairly, openly and with respect throughout the adoption process. Enquiries will be responded to promptly and prospective adopters given full information about the recruitment, assessment training and approval procedures. 2.9 Adoptive carers will be carefully recruited and trained and given access to a range of adoption support services. 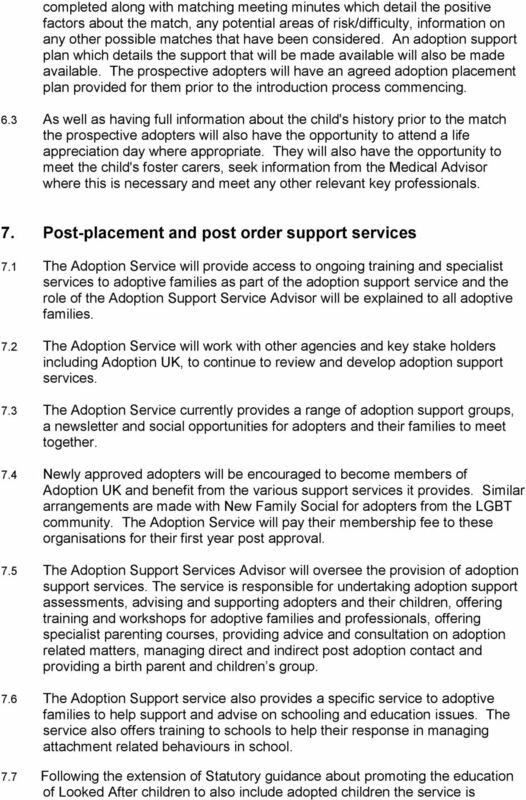 It is recognised that adoption has lifelong implications for all involved and requires lifelong commitment from a range of agencies and organisations that have to work together to meet the needs of those affected by adoption The preservation of adoptive families and the reduction of the risk of placements disrupting is a key aim of the service. The needs and background circumstances of children and their birth families will need to be fully assessed so that important matching considerations can be identified and children placed with adopters that are best able to meet their needs A range of adoption support services will be made available for children and adoptive families. If placements do disrupt in spite of intensive placement support, disruption meetings will be convened. All parties involved in the placement will be invited to attend and express their views and the views of the child will be sought. The disruption meeting will address the future needs of the child and the chair will ensure that a full record of the meeting takes place. Any lessons for future practice will be fully disseminated to all relevant parties Adoption support services are provided as required by the Adoption Support Services Regulations 2005 to all parties in the adoption process including adoptive adults, birth families as well as adoptive families. 4 2.13 The Adoption Service values the role that experienced adopters, adopted adults and birth parents play in the training, preparation and support of new adoptive families and will continue to work to facilitate contact between them Staff within the Adoption Service will receive supervision and access to a range of training opportunities to ensure they are well equipped to recruit, train, assess, and support adoptive families, family find and place children appropriately and provide support to adopted adults, birth families and others in the adoption process. 3. 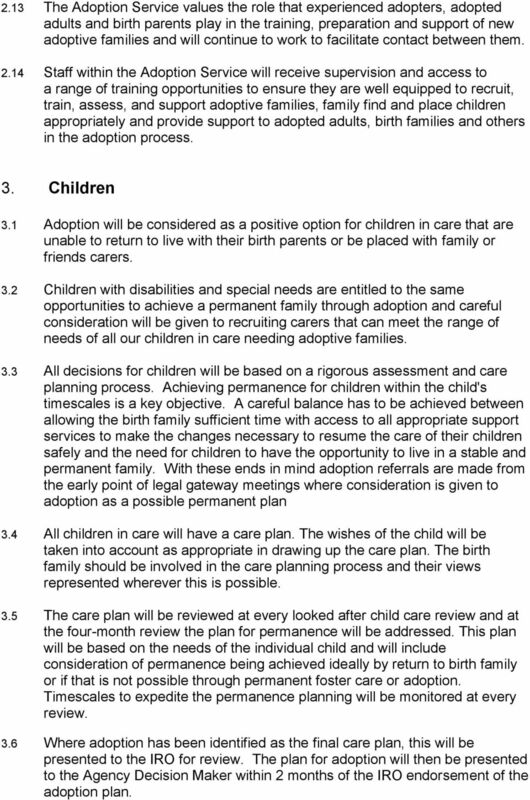 Children 3.1 Adoption will be considered as a positive option for children in care that are unable to return to live with their birth parents or be placed with family or friends carers. 3.2 Children with disabilities and special needs are entitled to the same opportunities to achieve a permanent family through adoption and careful consideration will be given to recruiting carers that can meet the range of needs of all our children in care needing adoptive families. 3.3 All decisions for children will be based on a rigorous assessment and care planning process. Achieving permanence for children within the child's timescales is a key objective. A careful balance has to be achieved between allowing the birth family sufficient time with access to all appropriate support services to make the changes necessary to resume the care of their children safely and the need for children to have the opportunity to live in a stable and permanent family. 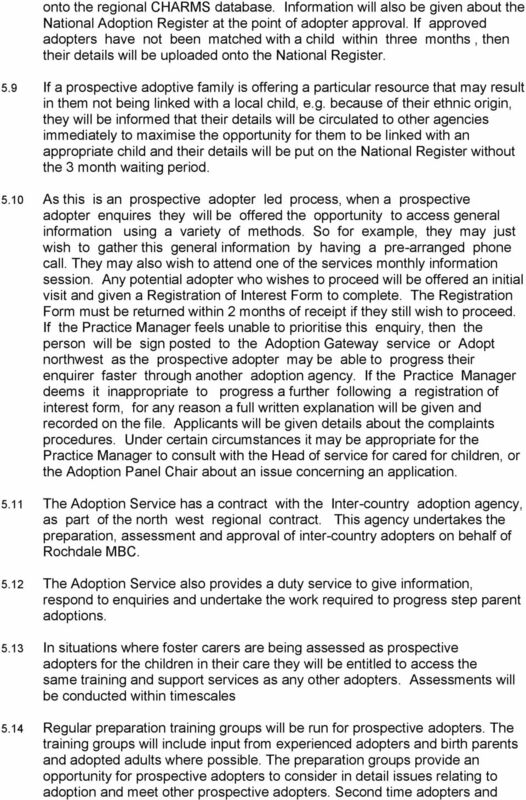 With these ends in mind adoption referrals are made from the early point of legal gateway meetings where consideration is given to adoption as a possible permanent plan 3.4 All children in care will have a care plan. The wishes of the child will be taken into account as appropriate in drawing up the care plan. The birth family should be involved in the care planning process and their views represented wherever this is possible. 3.5 The care plan will be reviewed at every looked after child care review and at the four-month review the plan for permanence will be addressed. This plan will be based on the needs of the individual child and will include consideration of permanence being achieved ideally by return to birth family or if that is not possible through permanent foster care or adoption. Timescales to expedite the permanence planning will be monitored at every review. 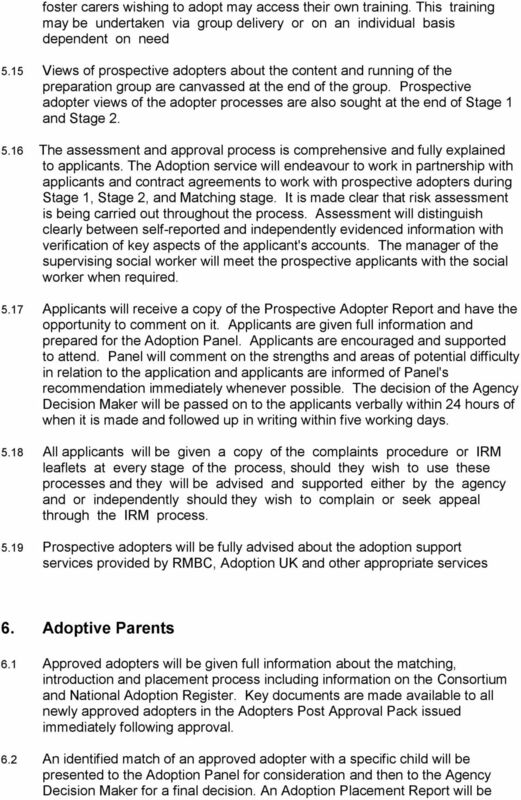 3.6 Where adoption has been identified as the final care plan, this will be presented to the IRO for review. The plan for adoption will then be presented to the Agency Decision Maker within 2 months of the IRO endorsement of the adoption plan. 7 must also be taken into account. A decision to separate siblings should be fully recorded on the file and explained to the child as appropriate. A clear contact plan for maintaining the link between siblings must be presented to the Agency Decision Maker at the point of an adoption decision as well as the adoption panel at the match of a child with adopter(s) Appropriate contact for children with their birth family will always be considered in the final care plan and welfare checklist for the child within the court proceedings. These plans will also be considered when the plan for the child is presented to Agency Decision Maker and to the Adoption Panel when considering a match. 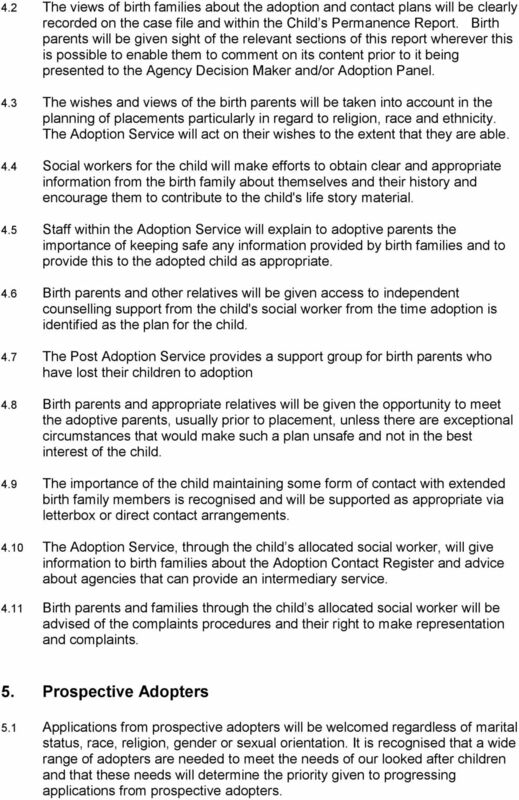 When direct contact arrangements are planned to continue post adoption the aim should be to promote a positive sense of identity for the child, not rehabilitation to the birth family Indirect contact arrangements for the child with his or her birth family will be arranged via the Adoption Service's 'letterbox scheme'. It is recognised that the child's needs for contact and information about their birth family will develop and change throughout their childhood. The Post Adoption Support Services will facilitate and review all contact arrangements Rochdale does offer birth parents an independent counselling service should they lose their children through adoption. This service is offered as a result of a partnership arrangement with Caritas Care Children with attachment difficulties and histories of a traumatic and disrupted past may need continued access to multi disciplinary services beyond placement and adoption. An adoption support plan for the child will be drawn up in conjunction with the prospective adopters and key agencies. 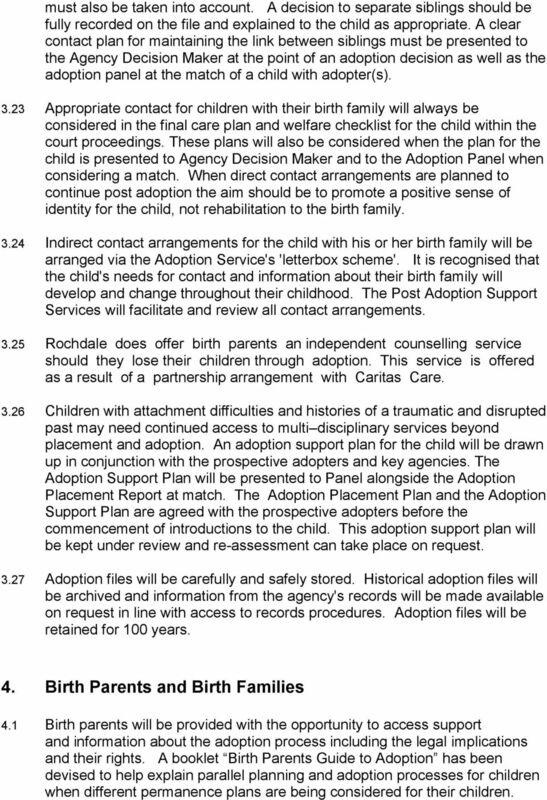 The Adoption Support Plan will be presented to Panel alongside the Adoption Placement Report at match. The Adoption Placement Plan and the Adoption Support Plan are agreed with the prospective adopters before the commencement of introductions to the child. 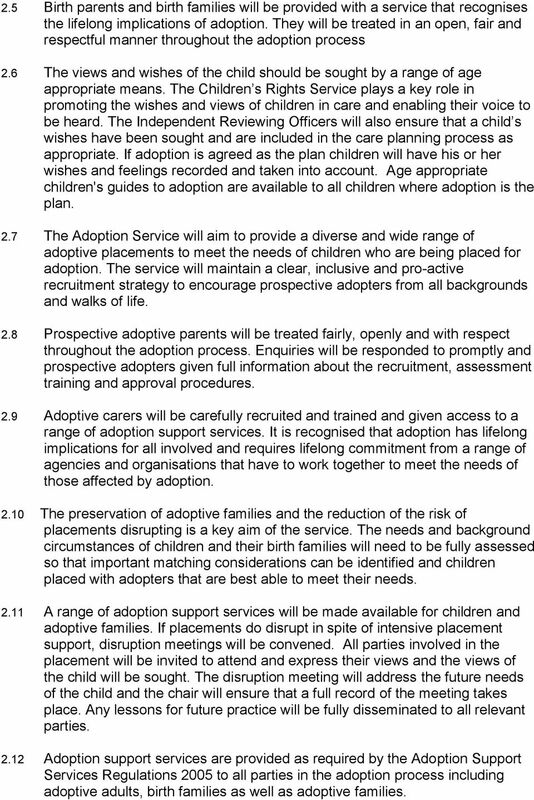 This adoption support plan will be kept under review and re-assessment can take place on request Adoption files will be carefully and safely stored. Historical adoption files will be archived and information from the agency's records will be made available on request in line with access to records procedures. Adoption files will be retained for 100 years. 4. Birth Parents and Birth Families 4.1 Birth parents will be provided with the opportunity to access support and information about the adoption process including the legal implications and their rights. A booklet Birth Parents Guide to Adoption has been devised to help explain parallel planning and adoption processes for children when different permanence plans are being considered for their children. 8 4.2 The views of birth families about the adoption and contact plans will be clearly recorded on the case file and within the Child s Permanence Report. Birth parents will be given sight of the relevant sections of this report wherever this is possible to enable them to comment on its content prior to it being presented to the Agency Decision Maker and/or Adoption Panel. 4.3 The wishes and views of the birth parents will be taken into account in the planning of placements particularly in regard to religion, race and ethnicity. The Adoption Service will act on their wishes to the extent that they are able. 4.4 Social workers for the child will make efforts to obtain clear and appropriate information from the birth family about themselves and their history and encourage them to contribute to the child's life story material. 4.5 Staff within the Adoption Service will explain to adoptive parents the importance of keeping safe any information provided by birth families and to provide this to the adopted child as appropriate. 4.6 Birth parents and other relatives will be given access to independent counselling support from the child's social worker from the time adoption is identified as the plan for the child. 4.7 The Post Adoption Service provides a support group for birth parents who have lost their children to adoption 4.8 Birth parents and appropriate relatives will be given the opportunity to meet the adoptive parents, usually prior to placement, unless there are exceptional circumstances that would make such a plan unsafe and not in the best interest of the child. 4.9 The importance of the child maintaining some form of contact with extended birth family members is recognised and will be supported as appropriate via letterbox or direct contact arrangements The Adoption Service, through the child s allocated social worker, will give information to birth families about the Adoption Contact Register and advice about agencies that can provide an intermediary service Birth parents and families through the child s allocated social worker will be advised of the complaints procedures and their right to make representation and complaints. 5. Prospective Adopters 5.1 Applications from prospective adopters will be welcomed regardless of marital status, race, religion, gender or sexual orientation. It is recognised that a wide range of adopters are needed to meet the needs of our looked after children and that these needs will determine the priority given to progressing applications from prospective adopters. 13 beginning to work closely with the Education service to ensure good educational outcomes for Looked after Children placed within an adoptive placement and adopted children. 7.8 The introduction of the Adoption Passport will support continued development of adoption support services and the closer working links with agencies such as CAMHS. 7.9 Adoptive parents will be supported to enable the child to maintain any appropriate contact arrangements, either direct or indirect, with birth family members or significant others. It is recognised that contact arrangements need to be carefully and sensitively managed and reviewed so they are suitable and can be adapted to meet the child s changing needs over time. 8. Adopted Adults 8.1 The Adoption service will provide a service to adopted adults that are seeking to find out information about their past history from case records held by RMBC and other agencies. The Service does not currently offer an intermediary service as defined within the Adoption & Children Act 2002 but will provide details of other agencies that are approved to provide such a service. 9. 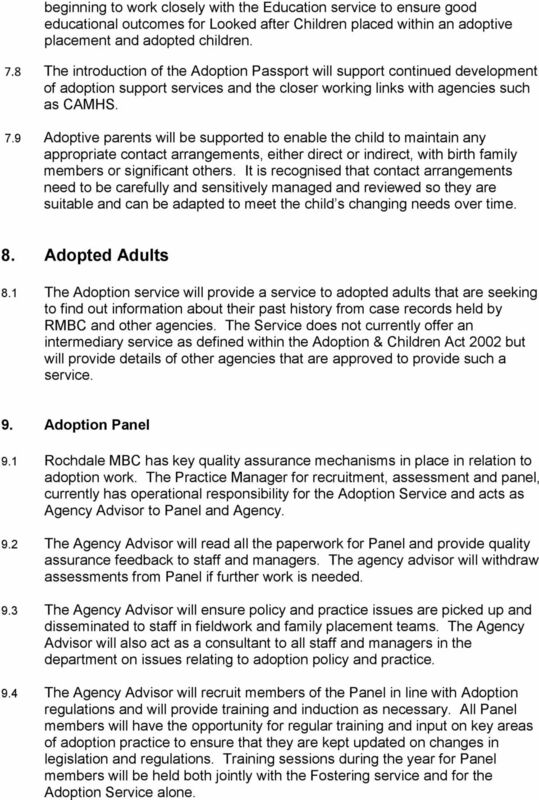 Adoption Panel 9.1 Rochdale MBC has key quality assurance mechanisms in place in relation to adoption work. The Practice Manager for recruitment, assessment and panel, currently has operational responsibility for the Adoption Service and acts as Agency Advisor to Panel and Agency. 9.2 The Agency Advisor will read all the paperwork for Panel and provide quality assurance feedback to staff and managers. The agency advisor will withdraw assessments from Panel if further work is needed. 9.3 The Agency Advisor will ensure policy and practice issues are picked up and disseminated to staff in fieldwork and family placement teams. 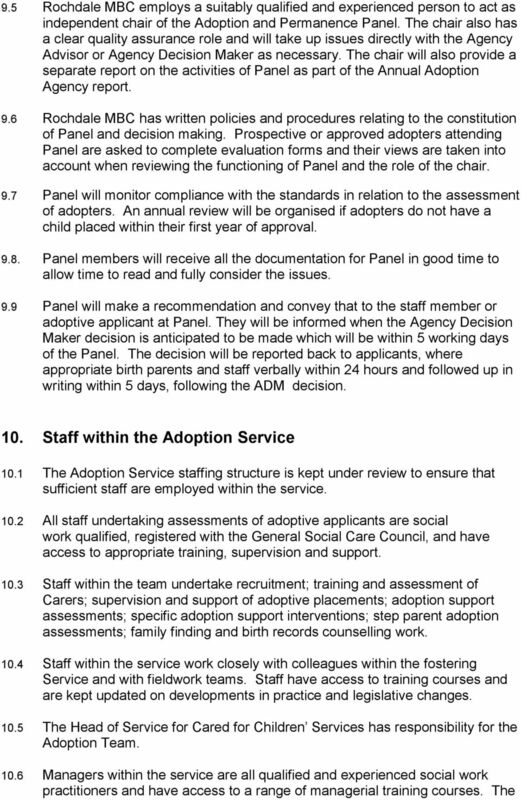 The Agency Advisor will also act as a consultant to all staff and managers in the department on issues relating to adoption policy and practice. 9.4 The Agency Advisor will recruit members of the Panel in line with Adoption regulations and will provide training and induction as necessary. All Panel members will have the opportunity for regular training and input on key areas of adoption practice to ensure that they are kept updated on changes in legislation and regulations. Training sessions during the year for Panel members will be held both jointly with the Fostering service and for the Adoption Service alone. 15 Head of Service is an experienced manager with management and social work qualifications. There are clear job descriptions and person specifications for all posts within the service The Adoption Support Services Advisor is Mary Brudenell, the Practice Manager for Family finding and post order support. The ASSA within the service will meet with the Assistant Director for Children s Social Care within the Children and Young People s Trust on a regular basis to update on key practice and operational issues and to ensure that any issues of a strategic nature are taken forward The Head of Service is Anthony de Crop. 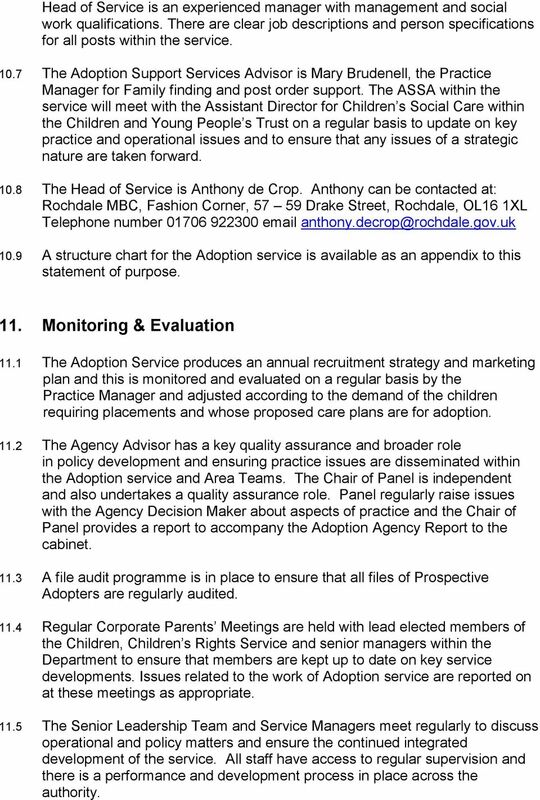 Anthony can be contacted at: Rochdale MBC, Fashion Corner, Drake Street, Rochdale, OL16 1XL Telephone number A structure chart for the Adoption service is available as an appendix to this statement of purpose. 11. Monitoring & Evaluation 11.1 The Adoption Service produces an annual recruitment strategy and marketing plan and this is monitored and evaluated on a regular basis by the Practice Manager and adjusted according to the demand of the children requiring placements and whose proposed care plans are for adoption The Agency Advisor has a key quality assurance and broader role in policy development and ensuring practice issues are disseminated within the Adoption service and Area Teams. The Chair of Panel is independent and also undertakes a quality assurance role. Panel regularly raise issues with the Agency Decision Maker about aspects of practice and the Chair of Panel provides a report to accompany the Adoption Agency Report to the cabinet A file audit programme is in place to ensure that all files of Prospective Adopters are regularly audited Regular Corporate Parents Meetings are held with lead elected members of the Children, Children s Rights Service and senior managers within the Department to ensure that members are kept up to date on key service developments. Issues related to the work of Adoption service are reported on at these meetings as appropriate The Senior Leadership Team and Service Managers meet regularly to discuss operational and policy matters and ensure the continued integrated development of the service. All staff have access to regular supervision and there is a performance and development process in place across the authority. 16 12. Complaints procedures 12.1 Users of the Adoption Service, including children, birth families, prospective and approved adopters and adopted adults, are provided with copies of the complaints procedure, advised how to access the procedure and encouraged to invoke it if unhappy with services provided. Service users are advised that independent sources of support are available to help them make a complaint and advocate on their behalf if they feel unconfident making a complaint by themselves, including access to The Children s Rights & Advocacy Service The Department commissions a Children s Rights & Advocacy Service from the Children s Society. 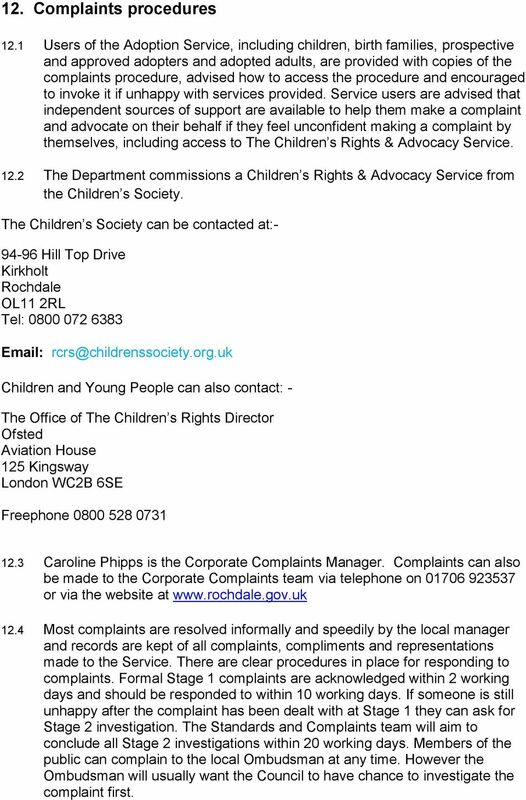 The Children s Society can be contacted at: Hill Top Drive Kirkholt Rochdale OL11 2RL Tel: Children and Young People can also contact: - The Office of The Children s Rights Director Ofsted Aviation House 125 Kingsway London WC2B 6SE Freephone Caroline Phipps is the Corporate Complaints Manager. Complaints can also be made to the Corporate Complaints team via telephone on or via the website at Most complaints are resolved informally and speedily by the local manager and records are kept of all complaints, compliments and representations made to the Service. There are clear procedures in place for responding to complaints. Formal Stage 1 complaints are acknowledged within 2 working days and should be responded to within 10 working days. If someone is still unhappy after the complaint has been dealt with at Stage 1 they can ask for Stage 2 investigation. The Standards and Complaints team will aim to conclude all Stage 2 investigations within 20 working days. Members of the public can complain to the local Ombudsman at any time. However the Ombudsman will usually want the Council to have chance to investigate the complaint first.